Upper back pain – thorough examination. • Pain with taking a deep breath, often indicates your ribs are involved. 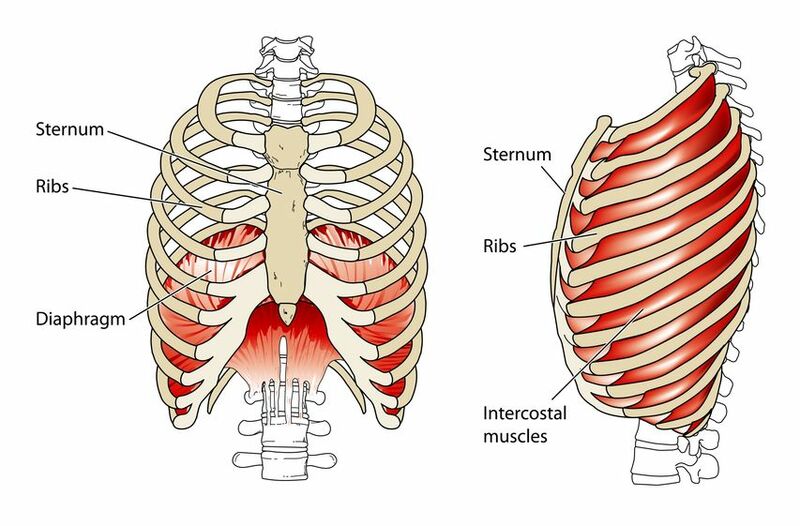 Rib pain is often described as sharp, stabbing chest pain which can radiate from your back to the front. This can be alarming as you may think you have a problem with your heart or lungs (it is important to exclude this possibility before seeking treatment from your Osteopath). Sometimes a rib can get stuck and cause upper back pain, muscle spasms, and difficulty with breathing. This is termed, rib dysfunction. It can be caused by poor posture, muscle imbalances or trauma (such as a sneezing or coughing attack). What contributes to your Upper Back Pain? People who spend lots of time sitting at a computer or driving are often affected by upper back and arm pain. Small changes to your desk or driving posture can make big changes to your symptoms (See Manual Handling). We will undertake a thorough examination to ascertain the exact root cause of your symptoms. Soft tissue massage, joint and muscle stretches are used to reduce tension stiffness in the muscles, joints, bones, ligaments, tendons and nerves. This helps to improve your flexibility and reduce your pain. In addition to hands on treatment your osteopath can also give advice about posture and exercise to help in the short term but also to prevent on going issues.